Features Glee's Billy Lewis Jr.
Gilly Gonzalez, Jessica Aronoff, Billy Lewis Jr., Marija Juliette Abney, and Paul Casanova in The Portal. Photo by Russ Rowland. BOTTOM LINE: The Portal is a cheesy experiment of culturally appropriated mysticism, but its production values are remarkable. I’ve never been to Burning Man, and I can’t predict what my future self will want in life, but I’m pretty sure I’ll never want to go to Burning Man. White guys going on vision quests in the desert because their life has no meaning? No thanks. But if Burning Man is your thing, and you crave desert energy (and a mish-mash of all types of mysticism appropriated out of their contexts), then The Portal is meant for you. The Portal is a non-linear experience that is part film, part concert-performance, and all experiential—so don’t go expecting a play if you’re a regular theatregoer. If it has to have a narrative, it’s loosely about a man named Dante who sacrifices his office job and city life for a life of simplicity and spirituality in the desert. He needs to overcome spiritual hurdles to reach serenity, and in The Portal, that "serenity" is a mystical, attractive lady who lures Dante into truth by the end of the show—just your average casual sexism. All of this is told in film format, and dancers and the band (Paul Casanova on guitar, Gilly Gonzalez on drums, and Billy Lewis Jr. as the show’s "Frontman") essentially illustrate and punctuate the action of the film behind them. This form serves the show's purpose well, and what it lacks in structure and content, it makes up in advanced digital/technical elements. The Portal has its advantages as a piece of digital film-based performance, but it lost me at its content—a cheesy and repetitive dreamscape without an endgame. Its mystical influences are corrupted. The Portal exploits what westerners expect cultural mysticism to look like (in the same vein that those white girls who wear Native American garb to music festivals think it’s okay to do so). I don’t blame the show for falling for that archetype, but I was a little disappointed in its lack of fundamentals of shamanism as a practice. Instead, the show's creators seem more interested in shamans as a decorative inspiration. I guess they wanted Billy Lewis Jr.’s character to be that "shaman," that spiritual guide between the mystical and the mortal-present. They even give him some cringe-worthy lines to hook us in to the experience (“Do you want to touch the naked body of your mind?” Well, when you put it that way, no, I really don’t.) The Frontman’s purpose as that guide just doesn’t compute. White men in man buns aren’t magic. Because the show doesn’t have the right research behind it to make it feel authentically mystical, there were a lot of moments that hang in the air without meaning to ground them in context. Because the Man leaves his phone behind when he enters the desert, he has an hysterical, Matrix-y, microchip-clad alter-ego berating his dull, paper-pusher self for leaving precious technology behind. The Matrix-y character then walks through the audience (we meet this character originally in the film), showing a few people a message on an iPhone (I didn’t see the message). Dante also confronts a hooded Angel of Death in the film, who stalks him throughout the desert; this Angel of Death also walks through the audience, which was undeniably creepy. I was sort of hoping we’d find out who was under that hood, but the image of the character surpassed the need to explain why this character existed in the first place, sadly. Music is the driving force of The Portal. It’s huge and sweeping, albeit repetitive, and takes inspiration from the psychedelic rock of the 70s…with a hint of bravado that reminds you of the innocent cheesiness of acts like Celtic Woman. Much of this sweeping music is an audio recording, but then there’s the band; we only have a drum and guitar to compete with a very loud audio recording of the rest of the music, so they are entirely drowned out. Billy Lewis Jr. sang very well (he was on Glee) but I could barely hear him over the audio recording either. I also found his dancing to be a distraction—I might’ve taken him more seriously as a musician first if he was planted at a microphone. He seemed unsure of his choreography. Not his fault—it’s hard to dance a story that’s very unclear. The Portal is probably better suited to an arena or an outdoor concert venue than an off-Broadway theatre. Its purpose is more experiential than narrative, and therefore should be treated as a concert first. 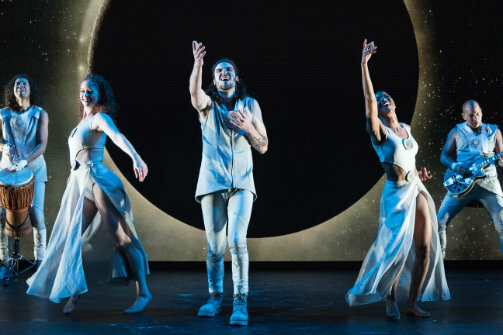 The show displays technical prowess, with awesome lighting by Traci Klainer Polimeni, and the music by Tierro Lee, Kan'Nal, and Lisa Gerrard is very exciting. So if you want a dose of Burning Man in New York City, The Portal calls your name. The Portal is created and directed by Luke Comer. Music by Tierro Lee, Kan'Nal & Lisa Gerrard. Choreography by Jessica Chen. Scenic consultation and design by Peter Feuchtwanger and David Goldstein. Costumes by Liene Dobraja. Lighting Design by Traci Klainer Polimeni. Sound Design by Peter Fitzgerald. Associate Direction by Paul Stancato. Stage Manager is Gregg Bellon. The cast is Marija Juliette Abney, Jessica Aronoff, Billy Lewis Jr., and Nicole Spencer. Musicians are Paul Casanova and Gilly Gonzalez.